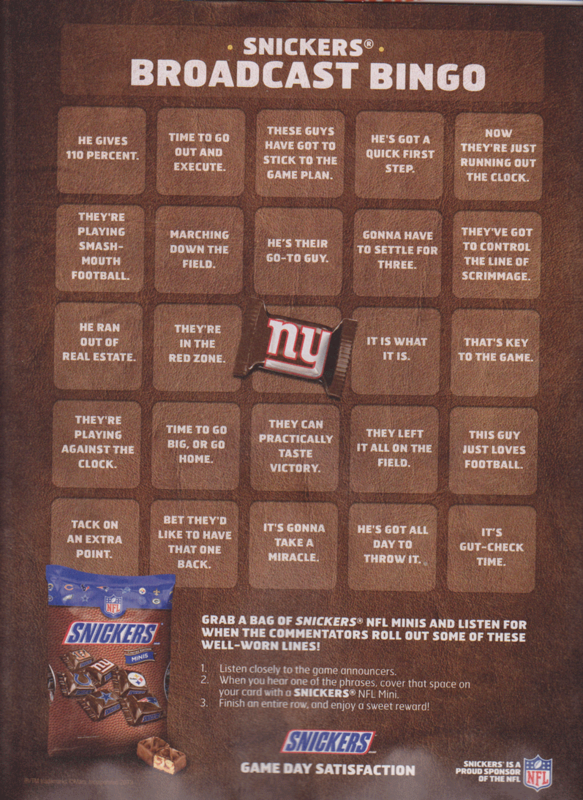 While sitting on the crapper reading ESPN The Magazine, I came across a great Snickers ad that pokes fun at broadcasters’ clichés, which any dedicated reader of The Nittany Turkey knows is right up my alley. They missed a few, like “untracked”, “athleticism”, and “physicality”, but no BINGO board would be big enough to hold them all! (They did get “it is what it is”.) I’m still wondering what the big prize is. Snickers deserves a free plug here for its ad agency’s creativity. Click on the thumbnail at right for a laugh. Another humorous bit was brought to me by RD. It seems that Spider and wife will be removing those names from all the PSU jerseys sometime soon. Here’s why. The Onion provides a tragic comment on ESPN’s programming choices. “How many times do I have to tell you guys?” After the Jets rookie quarterback stunk up the game Saturday night, Coach Rex Ryan inserted potential probable possible maybe perhaps starter Mark Sanchez, who promptly not only stunk up the game further but also fucked up his shoulder, jeopardizing a Jets season that doesn’t have a Chinaman’s chance, anyway. Rex does his best Joe Paterno act (“You guys don’t know what the hell you’re talking about!”) at the post-game media conference when questioned about the wisdom of his coaching maneuver. Courtesy of Deadspin. This is for my friend Todd, a fellow PSU football blogger who is also an ophthalmologist in his spare time. In connection with my prior post, he had noted that while there existed a surfeit of colonic humor, there was a dearth of eye (vitreous) humor. To remedy that sad situation, I hereby present this very old bit of vitreous humor. So, Dr. Bernstein enters the exam room and finds an older woman sitting there. He points to the eye chart on the wall and asks her to read the third line. So, he moves his pointer up a line and asks her again. “I can’t read it,” she says. He points to the top line and she still can’t read it. He then excuses himself and returns shortly with a bigger eye chart. He holds it a couple of feet from her. “Oy, no, I still can’t read it!” she insisted. “That’s disgusting, doctor! Of course I see it!” the woman retorted, revulsed.